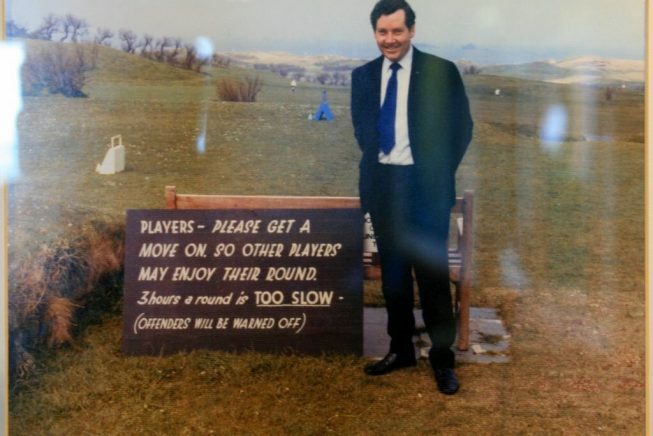 "3 hours is too long for a game of golf"
‘PG’, as he was affectionately referred by so many, took over the running of Trevose in 1960, on the retirement of John Westlake. Over the next 50+ years he dedicated his life to developing the Club in to the venue we are so proud to be a part of today – and that has given so much pleasure to so many golfers, families and friends over the years. PG was well known in Duchy golfing circles and beyond. He was Captain of the Cornwall Golf Union from 1983 – 1986 and County President from 1994 to 1996 before becoming President of the South Western Counties Golf Association in 2003 – 2004. He was also a Past President of the Cornwall Golf Alliance. Whilst his outings on the golf course were few and far between in recent years he soon made ‘the corner’ in the 19th hole his office – from where he held court on a daily basis. PG’s larger than life character, sense of fun and immense kindness will be greatly missed by many, both here at Trevose and in territories spread far and wide. As a Club we will miss him immensely but we will ensure his legacy, the fond memories and all his amazing achievements are celebrated for years to come. Please note a memorial service will be arranged at a date to be confirmed. All enquiries should be directed to R.J.Bray & Son (01208 812 626 or david@rjbray.co.uk). As many of you will no doubt be aware already, it’s with great sadness that we have to announce the passing of Peter Gammon, who died peacefully at home on 27 March 2019, aged 83.